Website builders like Wix make it easy to create a beautiful website or eCommerce store -- even if you don’t know how to code. 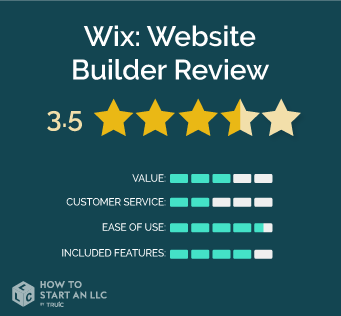 In this review, we’ll go over the details of Wix’s web-building platform and explain how it compares to other website builders on the market. Read on to find out if Wix is the right choice for you. Wix makes it easy to launch a simple, beautiful website. Although they don’t have as robust a set of offerings as some other website builders, their competitive price points have allowed them to remain a viable option in the web-building industry. That said, unfortunately Wix presents several major problems for users in need of advanced or high-traffic websites. We’ll dive into the details of these issues momentarily. Who is Wix right for? Wix is a great option for any individual or business looking to show off a visual portfolio and/or create a basic online store on a budget. Wix provides over 500 well-designed website templates. When it comes to page layout and overall design, the platform allows for a decent amount of customization. Wix offers an Artificial Design Intelligence (ADI) feature to help novice users generate basic sites. Like most web-building services, Wix requires no previous coding experience. Wix doesn’t allow you to change templates once your site has launched, nor does it allow you to export or download your own site. These limitations will severely hinder your ability to change hosting services or rebrand. Unlike most of their competitors’ templates, Wix’s are not automatically mobile-optimized. Users must make manual modifications in order to optimize their websites for mobile use. Weebly’s services start at $8/month (if paid annually). Apply a permanent 15% discount by clicking the How to Start an LLC link above. Who should purchase the Connect Domain plan? The Connect Domain package is the most bare-bones plan Wix has to offer. Keep in mind that if you choose to purchase this plan, your website will display Wix ads. Who should purchase the Combo plan? Because the Combo package still lacks many important features, like unlimited bandwidth and only a small amount of storage, it is only recommended for personal use. Who should purchase the Unlimited plan? The Unlimited plan is best for solopreneurs and freelancers. Who should purchase the eCommerce plan? The eCommerce package is Wix’s lowest-cost plan that includes eCommerce capabilities, making it a viable option for individuals and small businesses on a budget. Who should purchase the VIP plan? Wix’s most premium product is the VIP package. The $25 price point makes it a decent choice for small businesses with a bit more money to allocate toward their online presence. Wix does what every website builder is meant to do: it allows you to get a site up and running quickly and easily, without any previous knowledge of web-development. Moreover, Wix accomplishes this at a super competitive price point. When it comes to getting the most bang for your buck, Wix’s Unlimited and eCommerce plans tend to be the best options. With extra storage, unlimited bandwidth, $300 in ad vouchers, and some other advanced capabilities, these packages are well-worth a couple extra dollars per month. The Combo plan simply doesn’t offer a robust enough set of features to support a typical business website. That said, even Wix’s most premium packages have significant limitations that other website builders (like Weebly) do not. For instance, their VIP plan only includes 20GB of storage, and mobile optimization is an issue across the board. Point being, Wix may offer the perfect value for some users, but definitely not for all. Unfortunately, Wix’s customer service is not the best. While they offer phone and email support, they seem to make it intentionally difficult to find their contact information and get in touch with an actual customer service representative. To their credit, Wix’s Help Center is pretty thorough and easy to navigate. However, when it comes to atypical issues, Wix users may be out of luck. One of Wix’s major selling points is that the platform is extremely user-friendly, even for beginners. Their drag-and-drop design system and Artificial Design Intelligence make it possible for even the least tech-savvy individual to get a website up and running with ease. It’s important to keep in mind that using Wix’s ADI limits customization potential. It’s still a valuable tool, but we’d only recommend it to folks who are looking to generate a very basic website. As we’ve discussed, Wix’s most appealing features are their 500+ templates, Artificial Design Intelligence, and drag-and-drop design system. These features allow Wix users to animate text, integrate videos, and modify pretty much any aesthetic element of their websites. Unfortunately, Wix also lacks some important features like unlimited storage and exportability, and their online store functionality is relatively limited. For these reasons, Wix may not be able to accommodate the needs of all users -- particularly those seeking to run high-volume eCommerce stores. Although Wix is among the largest web-building services on the market, the window of users their platform suits is actually pretty narrow. We really only recommend Wix to users who don’t: 1) have the need for a super-sophisticated online store or blog, 2) intend to make significant changes to their online presence over time, or 3) plan on driving high traffic to their website. Again, Wix’s platform is made up of user-friendly tools that are perfect for novice users seeking to build a basic but beautiful website. However, anyone seeking more than this would be wise to check out Weebly, or one of Wix’s other competitors.